When I think of the beach, the first thing that comes to mind are all of the beautiful, colorful umbrellas as far as the eye can see... at least that's the way they are in Ocean City, Maryland - miles and miles of them! 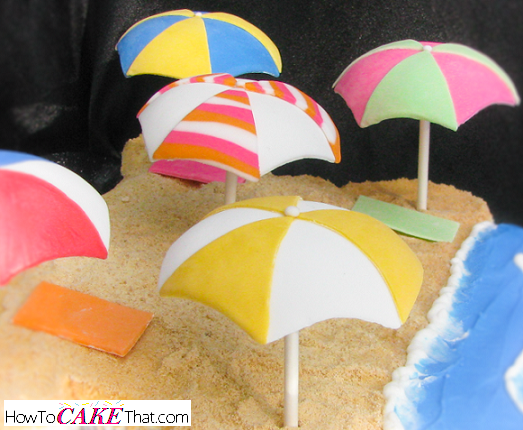 And if you plan on making a beach theme cake or cupcake spread soon, I have an easy tutorial to share with you on how to make a 3D edible version of them... and they really stand up! They look almost like the real thing, don't they?! Note: The umbrellas take a few days to dry, so plan ahead!! 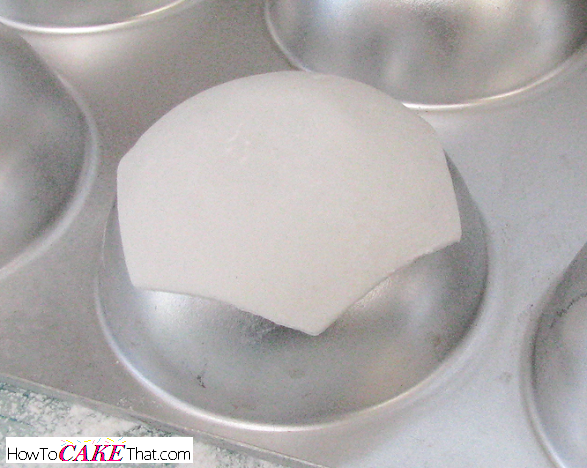 For this tutorial, I will be using the Wilton Mini Ball Pan. To begin, dust the inside of the half circles with cornstarch. Next, use a blend of 2 parts fondant, to 1 part gum paste (or you can use all fondant and add tylose powder), and color with gel colors, if using. 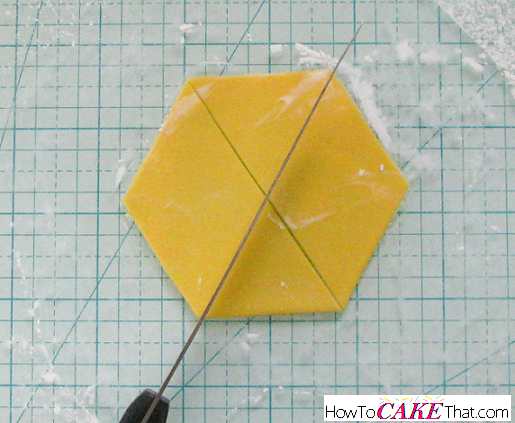 Roll out a thin layer of your fondant mixture and cut with a hexagon cutter (I'm using Fat Daddio's hexagon cutter - the size measures 2 7/8 inches from flat side to flat side). 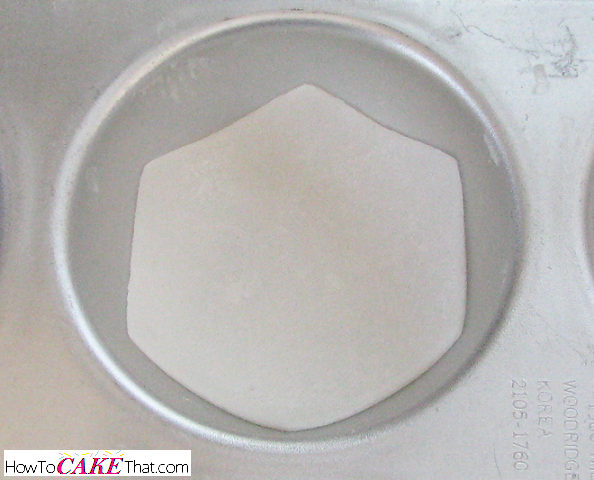 Next, place cutout in the cup of the mini pan and gently press the fondant piece down into the pan to allow it to take on the round shape of the inside of the pan. Allow to dry overnight. After the piece has begun to harden a little (about an hour) move the piece around to ensure it is not sticking to the pan. Add a little more cornstarch to the pan, if needed. Note: If your umbrella cutout will be larger than 2 7/8 inches, it will be too difficult to form it to the inside of the pan. I highly recommend using the underside of the pan for larger cutouts - as seen in above photo. Once your umbrella top has rested overnight and is fully dry, remove it from the pan and gently dust the cornstarch off with a soft clean brush. 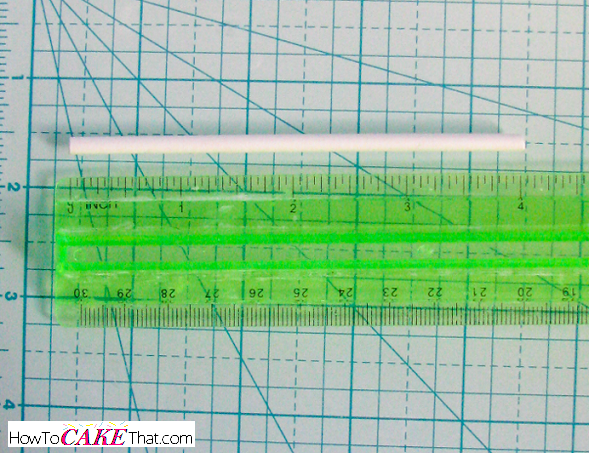 Next, trim a lollipop stick to desired size... allowing enough length to be inserted into your cake or cupcake. 4 inches is an appropriate length for my project. Note: if you do not have lollipop sticks, bamboo skewers or small wooden dowels will work just as well. Now it's time to glue the lollipop stick to the umbrella top. 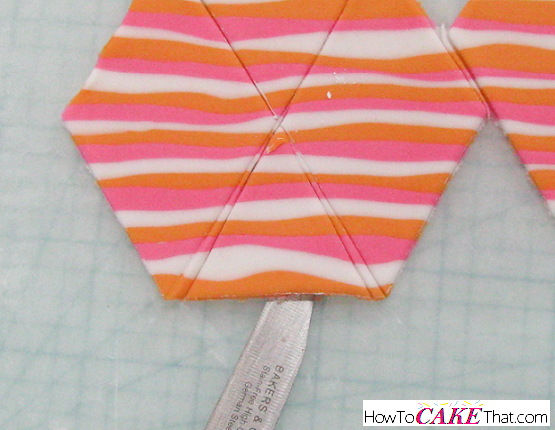 To do this, you can use either gum paste or melted candy melts (which would be the quickest way). 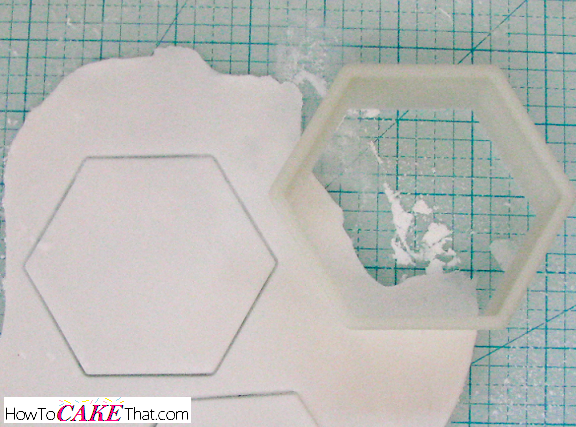 For this tutorial I am using gum paste. 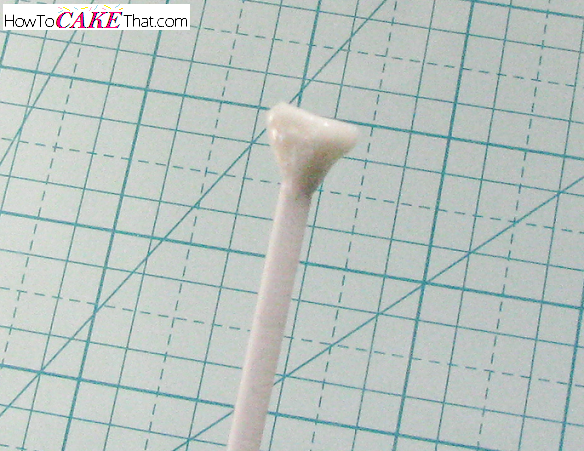 To attach gum paste to the end of the lollipop stick, dip one end of the stick in water and shake off any excess water. 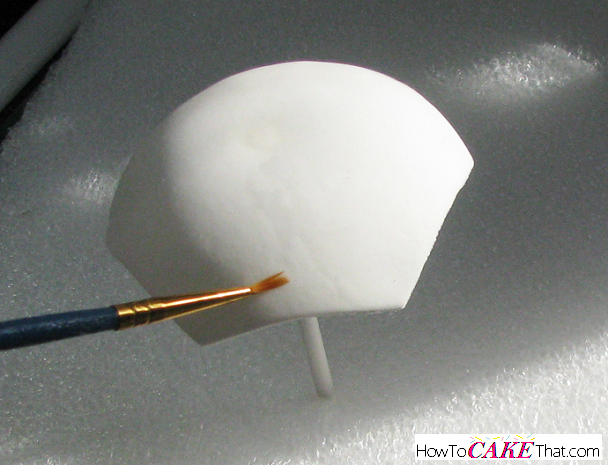 Place the gum paste onto the end of the stick and brush a very light amount of water over the gum paste. 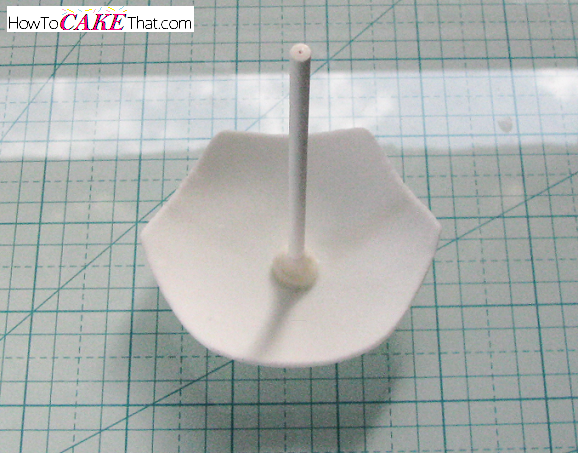 Place the gum paste end of the lollipop stick onto the center of the umbrella top. Allow to fully dry - this may take several hours or overnight, depending on how much water was used. I will be going over three different ways to add stripes to your umbrella top. 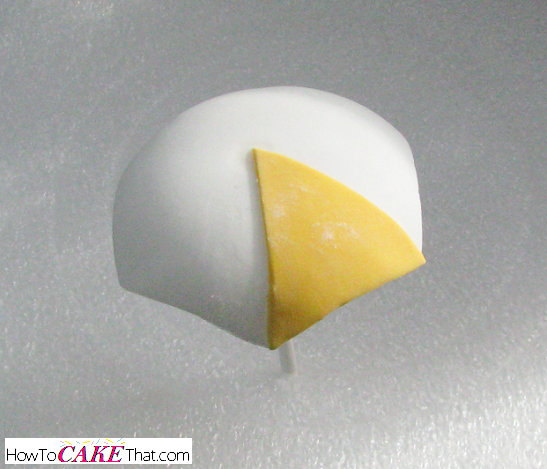 The first way is a single color using fondant. 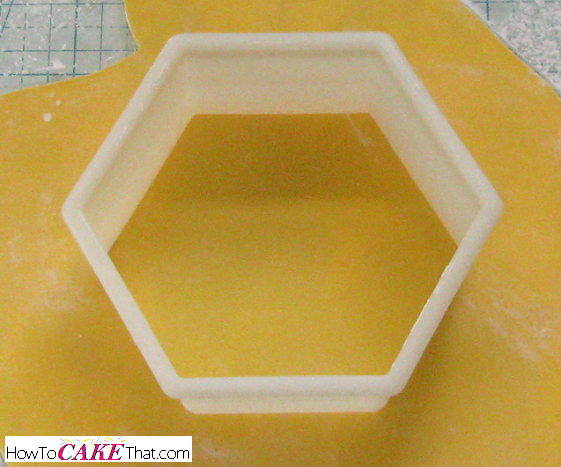 Roll out a thin sheet of fondant in a color of your choice, and cut out with the next size up hexagon cutter. In my hexagon set, this would be size 3 1/4 inches from flat side to flat side. Umbrella sections are shaped like triangles, so we will need to cut 3 triangles for our umbrella's colors. To do this, cut an "X" across the hexagon from point to point. This will give us two triangles. Then, cut one of the remaining diamonds in half across the two shortest distance points. Because these triangles were cut from a larger hexagon, the sides will be a little wider than what we need. Trim a small amount from the sides of the triangles, ensuring not to cut too much from the top and making the triangle too short. To attach the colored triangle pieces, designate a side where you'd like to place a triangle and brush a light amount of water onto the surface of the umbrella top. Place the colored triangle on the umbrella top, ensuring the tallest point reaches the center of the umbrella top. If the triangle is slightly too long and is hanging below the umbrella top, use your finger to tuck the excess underneath the umbrella, or use a razor or craft knife to carefully cut the excess off. Repeat these steps with remaining two pieces. 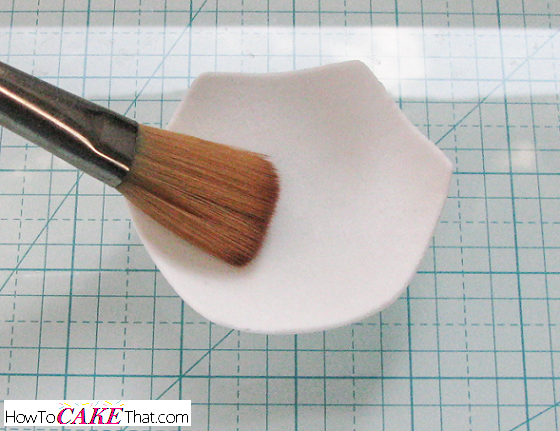 Dust off any extra cornstarch with a soft brush or remove cornstarch by very lightly steaming the umbrella. 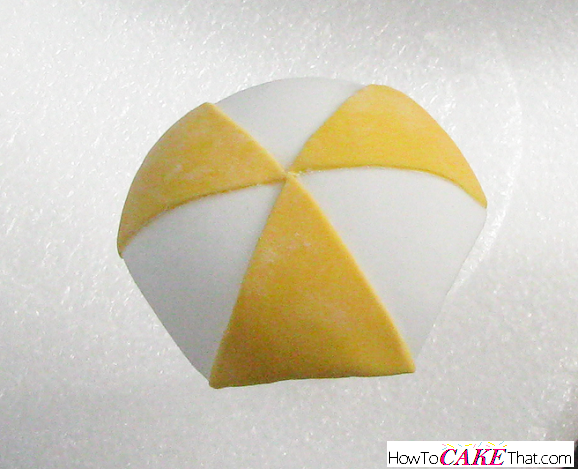 To add the final touch, brush a tiny amount of water where the tops of the triangles meet and roll a tiny ball of fondant and place on the center of the umbrella top. 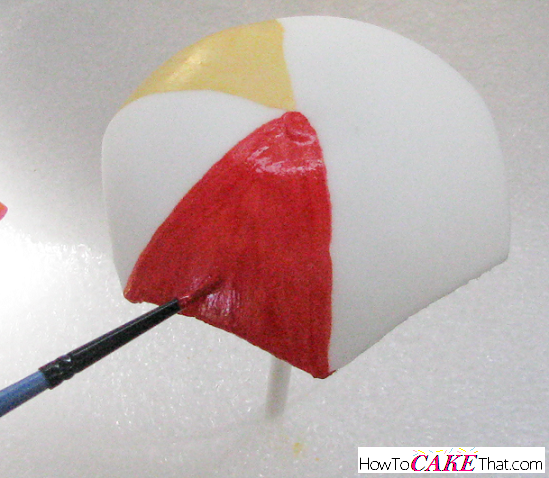 The second way to add color to the umbrella top is to make fondant stripes. For this umbrella, I will be making wavy stripes. 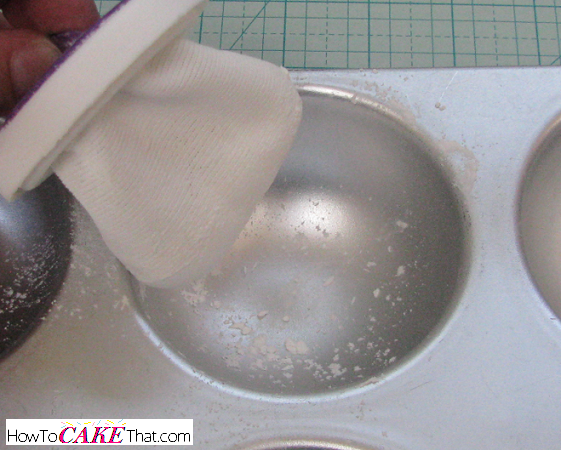 Place a piece of wax paper (or other nonstick food-safe paper) down on your work table. 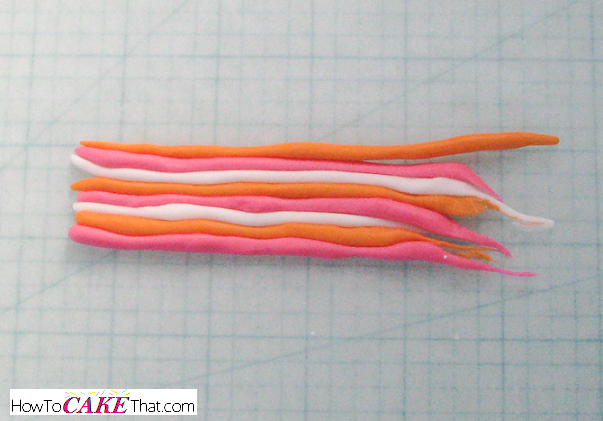 Roll out colorful strings of fondant between your palms and immediately place them next to each other on the wax paper while they are still sticky. Build up your pattern until the stripes are as tall as the larger hexagon cutter. 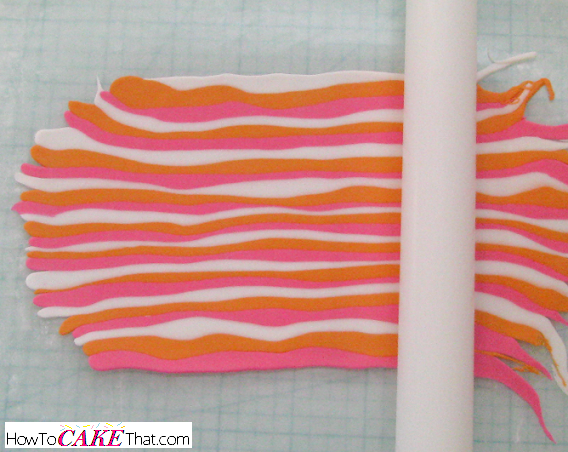 Note: For more uniform stripes, press your fondant through a clay extruder gun. Next, roll out the stripes over the wax paper until it is a nice thin sheet. Using the same method for the single color stripes, cut out triangle pieces. 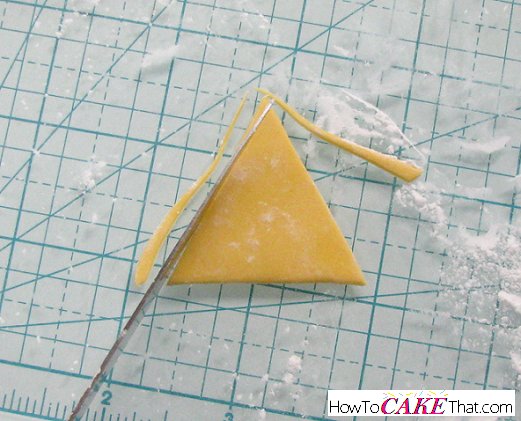 To remove the triangle from the wax paper, slide a thin knife under the triangle to separate it from the paper. Attach the triangles to the umbrella top with water. And the third and final method is to paint them by hand. For my paint, I used Wilton gel colors in golden yellow, Red-Red, and Royal Blue. I mixed my gel colors with a little Wilton's White-White and 150-proof alcohol and painted directly onto the umbrella top. Allow paint to dry. 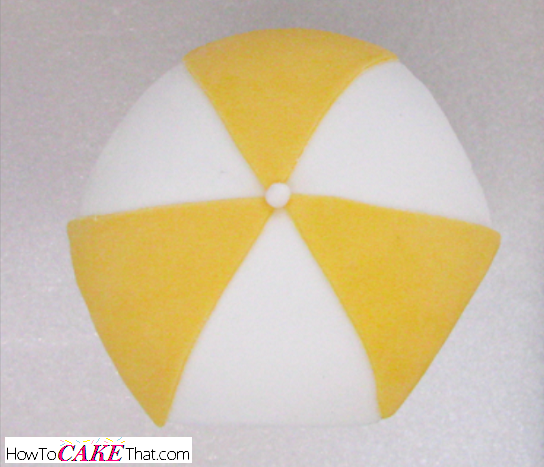 Once your edible umbrellas have fully dried, add them to your beach cake or cupcakes and enjoy!! 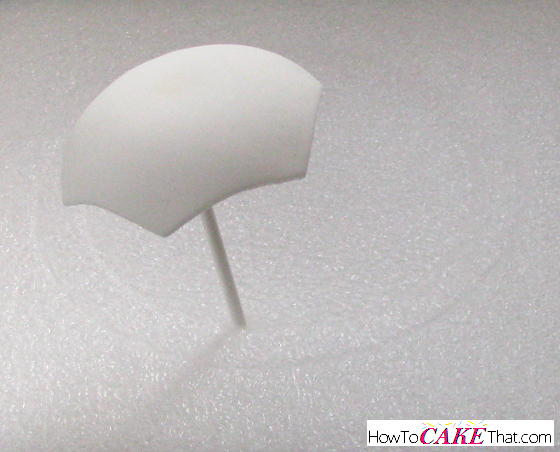 If your cake project will be delivered, be sure to add the umbrellas to your cake once the cake has reached its destination. The umbrellas are a little top-heavy and may fall over in transit. I hope you have enjoyed this tutorial! God bless! !